The 34th Anuga was the best trade fair in a long time for many of the exhibitors. More than 7,400 companies from 107 countries, a new record, presented products from all over the world and all categories over the course of five days. The 34th Anuga was the best trade fair in a long time for many of the exhibitors. More than 7,400 companies from 107 countries, a new record, presented products from all over the world and all categories over the course of five days. Around 165,000 trade visitors from 198 countries took advantage of this unique offer for sourcing, information and ordering at top level. In addition to the high level of internationality, which characterised the picture of the trade fair on all days, the quality of the visitors was once again outstanding. For example, Executive Directors and top buyers from leading global trading companies were registered. The out-of-home market was also represented by international teams in Cologne as well as decision-makers from the major online trading companies. They were all there: The registration data of Anuga shows that the entire trade was present in Cologne, both from Germany and abroad. They included Aeon, Ahold, AlbertHeijn, Aldi, Auchan, Carrefour, Coop, Costco, dm, Edeka, Globus, Hofer, Jumbo, Kroger, Metro, Migros, Müller, Norma, Rewe, Rossmann, Sainsbury, Sams Club, Schwarz Group, Sobeys, Spar, Target, Tesco and Walmart. Amazon and JD.com were present from the online trade. 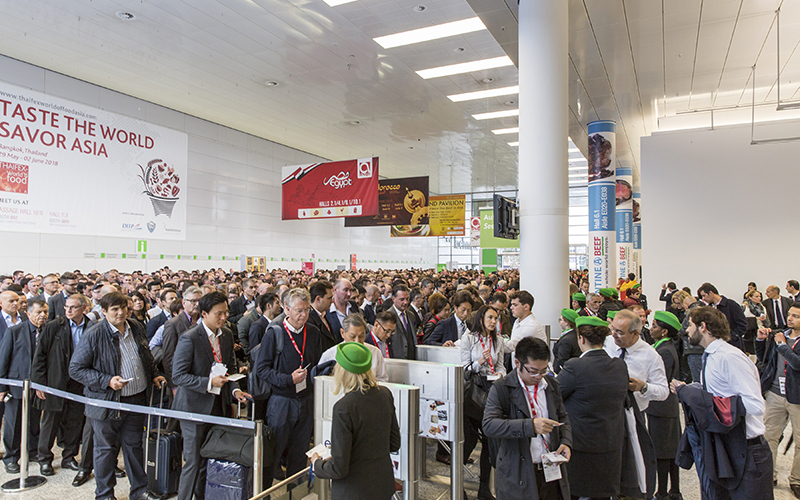 Furthermore, buyers from numerous specialised online platforms were also among the visitors of Anuga. Important importers and international wholesalers also travelled to Cologne to attend the trade fair. Important buyer groups from the out-of-home market (food service, communal catering, system gastronomy companies) were also welcomed at Anuga, among others Autobahn Tank & Rast GmbH, CHEFS CULINAR, Gourmet International, Ikea, LSG (Supply Chain Sarl), Sysco (USA), SPCgroup (Korea), Transgourmet and YORMA’S AG. Furthermore, it became evident again at Anuga that the trade fair is an indispensable sourcing platform: Many exhibitors were able to address their customers from the processing industry directly and conclude important contract transactions. The share of foreign participants was high both among the exhibitors (90 % foreign exhibitors) as well as among the visitors. The foreign share of visitors increased up to 75 percent (2015: 68 percent). As usual the attendance from the EU countries and Switzerland was high. An increase in the number of visitors was particularly recorded from Italy, Spain, France and the Netherlands. More visitors also attended from the USA and Canada. The attendance from China, Japan and the partner country, India, was also very good. More visitors were counted from South Ameria too, especially from Brazil, Peru and Uruguay. There was also an increase in the number of visitors from the Near East and states of North Africa, i.e. from Iran, the United Arab Emirates, Morocco and Tunisia. More people visited Anuga from South Africa as well this year. The export-oriented food industry was thus able to reach an international and first-class trade audience at Anuga. The innovations, which as always were a key focus of Anuga, contributed towards providing the industry with new impulses and ideas. These trend themes included food and beverages that are rich in protein, new products on the theme “superfoods” and numerous new ready-to-go/ready-to-eat ideas. Sustainable concepts as well as organic products were still high in demand, vegetarian and vegan themes were also a major focus. Alternative sources of protein like insects were a theme of intense discussion among the media.